Samsung Gear 360 (2017) live streaming now enabled for iOS! Samsung has updated the Samsung Gear 360 2017 app for iOS to add live streaming capability, which was previously available only on Samsung phones! When the Samsung Gear 360 2017 was released in April, everyone was excited because for the first time, Samsung made the Gear 360 compatible with iOS. Unfortunately, users soon found out that iOS compatibility was limited. 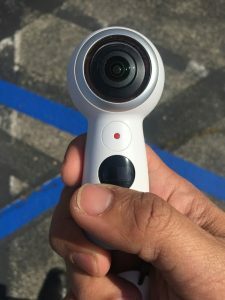 Resolution would be a little lower and it would not have live streaming, which had been one of the key features of the Gear 360 2017. Today, however, Samsung updated the Gear 360 app to version 1.4.17080402 to enable live streaming for iOS on Facebook. No word yet on live streaming on YouTube with the iOS Gear 360 app. Samsung Gear 360 2017 is currently one of the most affordable 4K 360 cameras. There are also many units being sold on eBay for as low as $129. Thank you very much to Jamie Baxter for bringing this to my attention!